I’d been watching out for the Lancome x Kate Winslet Golden Hat Foundation collection for a while since I first caught wind of it. The face powder with the golden hat looked quite intriguing and I have to admit that Lancome has been coming up with more and more pretty face palettes lately. The Kate Winslet Golden Hat Foundation collection is also Lancome’s Christmas collection this year which explains the lip and nail shades. 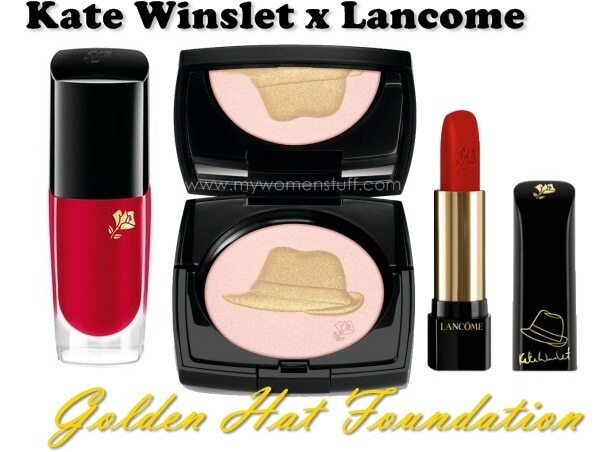 The Golden Hat Foundation was set up by Kate Winslet for autistic children and in conjunction with that, Lancome set up this collection for her and has promised to donate at least €150,000 of its sales profits to the Golden Hat Foundation. The star of the show, the Golden Hat Illuminating Powder will only be sold as a purchase with purchase. I caught a glimpse of the powder at a counter over the weekend and it does look very nice. It being sold as a PWP however put a bit of spanner in my plans. The L’Absolu Rouge lipstick will retail on its own at RM80 each and I believe comes in a few shades, but the only colour I’m eyeing is the red Caprice No. 132. Might it be worth a splurge? There is also a Le Vernis nail colour in the collection but I don’t think we will get that locally. I don’t have a price for it anyway. So what say you? Will you be picking up anything from this collection? Or will you wait for the next one? The Golden Hat Illuminating Powder will retail at RM80 with every RM200 Lancome purchase, L’Absolu Rouge lipstick will retail at RM80 each. Availability of nail polish unknown. Am horribly lemming for it right now, but it’s for a good cause, no? @Monstro: totally agree with you! Just let us buy the palette without forcing us to get rm200 worth of stuff first! For me it is 🙁 I read somewhere it’s selling at RM120 so maybe they’ve changed their minds since I got the release. I ended up getting the Bobbi Brown Holiday Shimmer Brick in Gold and Silver instead! Oohhh I saw that one! It’s very pretty too and I read that it’s not as crazy shimmery as it looks!